Empowering finance users to make faster, better decisions. Do you need help to automate your P&L, Balance Sheet or Cash-Flow reporting? Or maybe you wish to add a forecasting element to your reports by harnessing the power of advanced analytics? No matter which stage of your analytics journey you are at, we can help you move to the next level. Our range of finance solutions give you an overview of what’s possible, keeping in mind that creativity is the only limiting factor in the analytics field. Problem: Your financial reporting is still a monthly manual task and doesn’t provide you with more information than the basics? 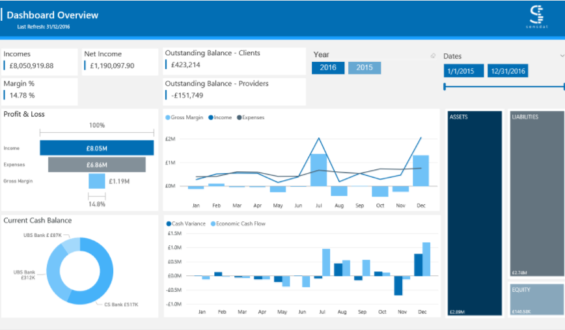 Solution: Helping Finance and Operations Managers feel in total control over the business by enabling them to monitor their financials seamlessly, with an interactive P&L and balance sheet report that highlights performance indicators. Problem: Your cost management reporting is still a monthly manual task and you struggle to understand clearly key facts such as “what are my main cost drivers by actual cost and cost per FTE and which managers should be held accountable”? 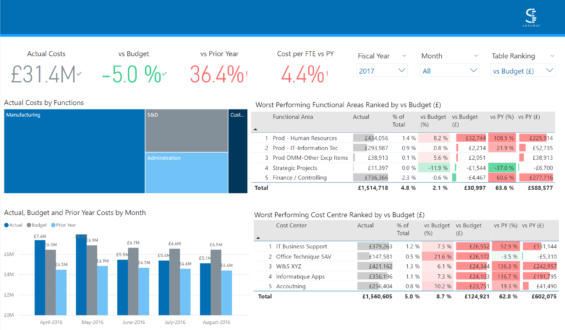 Solution: Helping Finance and Operations managers feel in total control over your cost KPI’s and empower your finance team to improve their cost-related KPIs by making quicker, smarter decisions with this tailorable Cost Management Dashboard Solution developed in Microsoft Power BI. 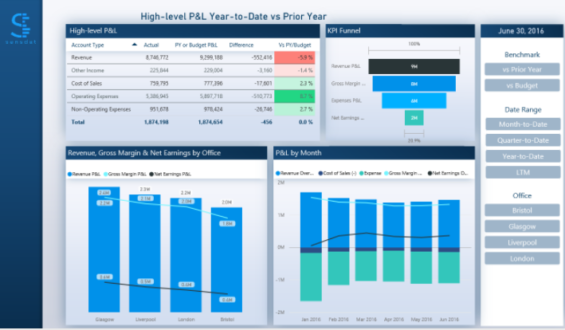 Feel in total control of your main Financials KPIs - P&L, Balance Sheet, Cash-Flow, AR, AP - with this Power BI Product for Dynamics NAV Financials. If you wish to connect this solution to your Dynamics NAV, give us a shout.